A joyous collection of tributes-both original and previously published-that celebrate the gifts of remarkable teachers. Teachers have always made an indelible impression on their charges. 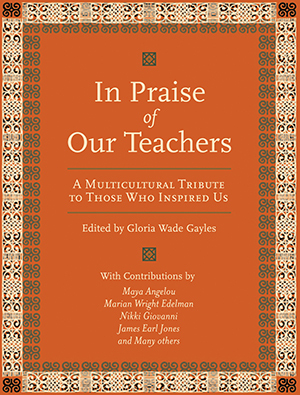 Now, in this new book, Gloria Wade-Gayles has brought together a winning and touching collection of pieces about teachers and teaching, with inspiring and dramatic anecdotes woven in. Each story offers a new and unique perspective on some of our country's most beloved teachers. about having a crush on his third grade teacher. Marian Wright Edelman celebrates Howard Zinn's teaching style, his insistence on exploration and questioning; and Zinn himself provides an opinion on the profession he has practiced for most of his life. But we also hear from a diverse group of students: writers who were part of the first wave of integration in their school system and immigrants who learned to speak English and participate in American culture in their schools. We get stories from Catholic schools, pubic schools, college classrooms, and more. In this age of standardized testing, In Praise of Our Teachers is a wonderful reminder of the immeasurable influence that teachers will always have on their students.